Those of you who have been following our previous posts on the 2013 Draft Open Space Strategy will be aware that GERA has been requesting details of the strategy’s reported 11.9 ha (119,000 sqm) increase in Glen Eira’s Open Space from that reported in the 1998 Strategy. GERA’s initial (3/12/2014) and follow-up requests do not stem from a desire to “nitpick” but rather a belief that the practice of “good governance” (and its principles of openness, transparency and accountability) requires advising the community when a change of definitions has occurred and providing an analysis of the impact of the definitional changes when presenting documents to the community. The significance of Glen Eira’s well documented lack of open space* and the community’s long held and well expressed governance concerns adds emphasis to this requirement in this instance. GERA received the requested details (ie. the 1998 Open Space Strategy’s Working Paper C – Public Open Space Inventory and Inventory of Buildings within Open Space Areas last Friday (7/2/2014) and has undertaken Council’s recommended D.I.Y. (Do It Yourself) comparison/reconciliation. The comparison/reconciliation results are very disconcerting due to the disparity of the results; area differences are recorded for most parks (whatever the size) and those differences are often contrary to expectations. The statement that “From these definitions it can be deduced that the 1998 strategy did not include Council leased facilities such as tennis courts, bowls clubs and croquet, etc.” indicates a reasonable expectation of area increases in those parks with such facilities and a zero area change to those parks without such facilities. Yet surprisingly, and inexplicably, this is not necessarily the case. For example, Bailey Reserve records an area decrease of 1.37 ha or 13,700 sqm, Duncan McKinnon Reserve records an area decrease of 0.27 ha or 2,700 sqm, and the Glen Rigney Memorial Reserve has doubled in area – 1998 0.03 ha or 300 sqm to 0.06 or 600 sqm in 2013. There are numerous other such discrepancies. Such unexplained anomalies raise many questions re the detailed knowledge and management of Glen Eira’s extremely valuable open space assets and the validity of the data presented in both strategies. While doubts may be readily cast on of the 1998 Strategy, doing so legitimately raises additional questions related to the time elapsed (16 years) to identify the 1998 “errors” and the validity of park master plans (all based on the 1998 strategy and which Council indicates are strictly adhered to, eg. the recent controversial Caulfield Park tree removal). Mallanbool Reserve (2.21 ha or 22,100 sqm) was not included in the 1998 survey and is a valid addition to Glen Eira’s open space in the 2013 Strategy. the addition of Mallanbool Reserve (2.21 ha), Booran Road Reservoir (1.7 ha) and Packer Park (1.99 ha**). indicates that most of the net 11.9 ha increase is attributable to “definitional change” and highlights the governance aspect raised above. 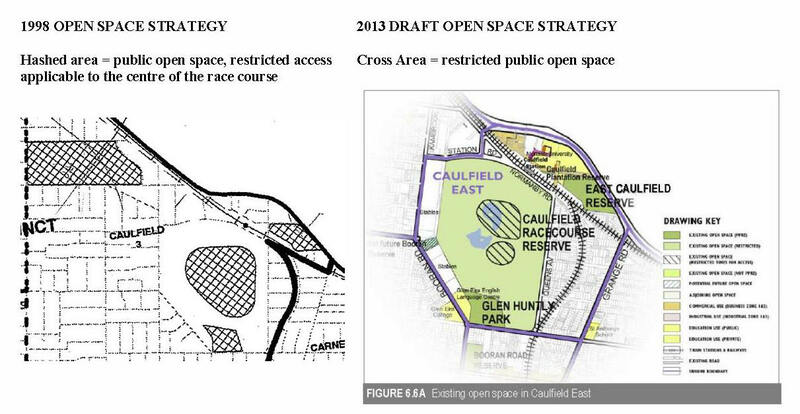 It also highlights GERA’s comment, included in our submission to the 2013 Draft Open Space Strategy that Council’s exclusion of the Centre of the Caulfield Racecourse on the grounds of “restricted public access” is fundamentally flawed when the “definitional change” allows for the inclusion of leased facilities that cumulatively approach the Centre in size yet have more restrictions to public access than does the Centre. 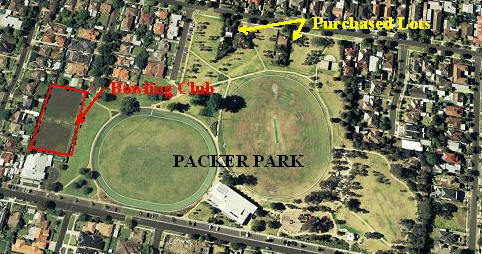 ** the reported increase in Packer Park (1.99 ha, 19,900 sqm) includes the purchase of two house lots and the previously leased bowls club that Council proposed to sell to raise funding for the purchase and rehabilitation of the 2 house lots. Generously assuming that the house lots comprised 0.4 ha (4,000 sqm), the remaining 1.5 ha (10,500 sqm) of the 1.99 ha increase constituted Council owned and leased land and as such is considered to be a definitional change. Under the revised definition of open space, had the Bowls Club remained it would have been included in the 2013 Strategy. Council’s rehabilitation works changed public accessibility rather than the area’s definition status. Booran Road Reservoir (1.73 ha, 17,300 sqm) – Crown land (State), management rights granted to Council in 2010 – rehabilitation works scheduled to commence in 2015/2016. 2 Packer Park house lots of unknown area (assumed to be 0.4 ha or 4000 sqm – refer above) purchased in 2011 ($1.911m). This limited achievement comes despite residents continually expressed open space long term goals, a rapidly rising population and Council statements recognising Glen Eira’s need for increased open space and promises of active acquisition (via purchase and government grants). The 1998 strategy’s “suggested” expenditure of the developers open space contributions as 50% split between acquisition and existing park improvements has been ignored. Aside from the Packer Park house lots, open space contribution ($12.8m for the period 2003/4 to 2011/12) has been spent on capital works in, or maintenance of, existing parkland. This is an imbalance that needs to be rectified. Open Space Contributions to be held in reserve for the purchase and rehabilitation of the purchased additional parkland. Ensure that the current maximum open space contribution rate of 5% of unimproved land value to applied to all multi unit developments within Glen Eira as a priority. In addition GERA also advocates that, in line with good governance practices, Council advises the community when definitions change and provides an analysis of the impact the changes. * Glen Eira has the least per capita open space ratio in Metropolitan Melbourne which, at 1.4 ha per 1000 population, is approximately half of the average ratio for Metro Melbourne. Posted on February 4, 2014 | Comments Off on OPEN SPACE INCREASE ??? GERA had hoped that our first posting for 2014 would include the details of 11.9 ha (119,000 sqm) increase in Glen Eira’s open space provisions between the 2013 Draft Open Space Strategy (172.9 ha) and the 1998 Open Space Strategy (161 ha) as mentioned in our previous posting. Unfortunately we are unable to do so. Although Council confirmed (emailed 23rd December, 2013) that most of the 11.9 ha (119,000sqm) was attributable to “definitional changes”, Council’s response did not include the details of the “definitional differences” and Council has yet to respond to GERA’s follow-up emails (9/1/2014, 23/1/2014 and 3/2/2014). Council’s response indicates, that aside from the 2011 purchase of 2 lots abutting Packer Park ($1.9m – no sqm provided) Council has not actively pursued purchasing additional open space as suggested in the 1998 Strategy. Instead the most significant and “real” additional open space increase over the past 15 years has come from grants of land management from the State Government. As per the 2013 Strategy these land management grants comprise 3.94 ha (39,400 sqm) and consist of the Mallanbool Reserve (2.21 ha – an excellent park but a questionable inclusion in the 2013 Strategy, refer below) and the Booran Road Reservoir (1.73 ha). While GERA is awaiting Council’s definition of “leased facilities”, the exclusion of “allow public access for outdoor recreational use” from the 2013 Open Space definition enables the inclusion of facilities with restricted access to be counted as Open Space. Please note that GERA is not questioning the significant contribution “tennis courts, bowls clubs and croquet, etc.” make to the health and wellbeing of the community nor do we question Council’s role in providing these facilities per se. What we do question, however, is their inclusion without identification or quantification (hectares/sqm) while Council’s justifies the exclusion of the centre of the Caulfield Racecourse from the strategy due to restricted access. Similarly, GERA is also questioning 2013 Open Space definition including “larger urban and civic spaces and forecourts” and the extent to which this provides for the inclusion of pavilions and car parking. Such an action item and the 1998 open space definition suggests that the site was, or should have been, included in the 1998 Strategy even though landscaping and rehabilitation works were not yet completed (circa 2006 – making the “newest” reserve/park approx. 8 years old). The Booran Road Reservoir (also known as the Glen Huntly Reservoir), as per our earlier post was first proposed to be given to Council late 1990s. Although Council held it’s first community consultation in 2008 (at which the residents overwhelmingly voted for retain and convert the site to passive parkland rather than sell the site for development), the wheels of government move slowly and the reservoir was not officially placed under Council’s management until 2010. At the second community consultation in June, 2012 (residents again overwhelmingly voted for conversion to passive parkland rather than active or mixed use parkland), Council stated that “Council has budgeted for work to commence on the park in 2016/17 and would be completed in 2018/19”. The 2013 Strategic Resources Plan decision to “From July, 2013, 100% of Public Open Space contributions (a.k.a Open Space Levy or Revenue) will be allocated to acquisition or improvement of additional open space (including the Reservoir), not pre-existing open space” and resulted in the reservoir’s rehabilitation works commencement and completion dates being brought forward by 1-2 years (ie. commencement 2015/16 – $5m, completion 2016/17 – $4.5m). While GERA welcomes bringing the park conversion forward, we are concerned that rather than funding the already budgeted rehabilitation works from Council revenue, the Open Space Contribution revenue will reserved to fund the reservoir rehabilitation works, rather than being held in reserve to take advantage of unplanned opportunities to purchase additional open space (eg. 2012 Alma Club, Caulfield North – 0.71 ha, 7,100 sqm; or in 2012 487 Neerim Road, Murrumbeena 0.3 ha, 3,142 sqm) which would have doubled the size of the existing Riley Reserve). 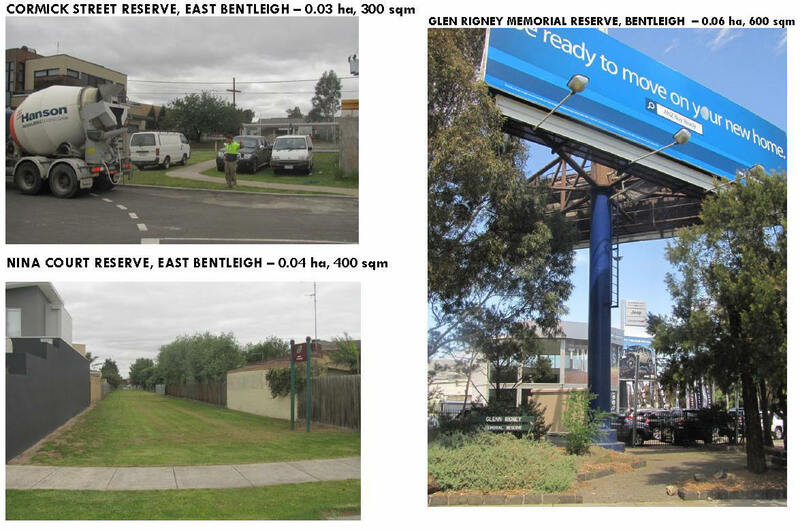 Not actively pursuing additional open space opportunities via purchase (as well as government land grants) will be to the detriment of current and future residents as increased development intensity results in reduced private open space and a significantly increased demand on Glen Eira’s well documented, currently inadequate open space. While GERA accepts that these legitimate and valued minor locations have the potential to become “pocket parks” it is unfortunate that Council appears to have down little increase their appeal to residents. GERA is aware that Section 6 of the 2013 Draft Open Space Strategy includes a locality based listing of open space included in the strategy and is willing to follow the Director of Community Relations suggestion of undertaking a D.I.Y. reconciliation of the 1998 vs. the 2013 strategy. However, we are unable to do so. Although the 1998 strategy references “Working Paper C – Public Open Space Inventory” and “Inventory of Buildings within Open Space Areas” these documents were/are not included in the documentation made available to residents. As mentioned above, GERA has previously requested this information on 3/12/2014 ( with follow up 9/1/2014, 23/1/2014 and 3/2/2014) Council’s analysis or the details that would enable us to undertake our own analysis. At the time of posting GERA is awaiting Council’s Response. The 1998 strategy (page 6) states Glen Eira has “over 60 individual parks and gardens comprising 161 ha of open space, 4.2% of the total municipal area” with the term “open space” being defined as including “ ‘public’ open space, which includes all areas owned by Council and other Government agencies that allow public access for outdoor recreational use. This includes all parks, reserves, gardens and structured outdoor areas such as sports fields that provide outdoor leisure use for the community”. The 2013 Draft Open Space Strategy (page 3) states Glen Eira has “70 open space reserves, 172.9 hectares of open space, 4.5 per cent of the total municipal area is open space (excluding Caulfield Racecourse Reserve) with the term open space being defined as “the publicly owned land that is currently set aside, or has the potential in the future to be set aside primarily for recreation, nature conservation and passive outdoor enjoyment. This includes parks, reserves, gardens, larger urban and civic spaces and forecourts”. Comments Off on OPEN SPACE INCREASE ??? 4/2/2014 – Unfortunately the recent Festive Season and associated vacations has meant GERA has been remiss in updating this posting. Apologies to Council for not acknowledging their 23/12/2013 response earlier. Unfortunately Council’s response did not include the requested details of 11.9 ha increase in open space over the past 15 years and to date our follow up requests (9/1, 23/1, 3/2) for that information remain unanswered. Details of those requests and our analysis of Council’s 23/12/2013 response are included in our subsequent post. 19/12/2013 – Below is GERA original posting on our Submission to the 2013 Open Space Strategy. Our submission refers to a 11.9 ha (119,000 sqm) open space area difference between the previous open space strategy and the currently proposed strategy – a period when Council divested land. As yet GERA’s requested clarification of this difference ( 3/12/2013 ) remains unanswered and was followed up today. Below is GERA’s submission to Council on the 2013 Draft Open Space Strategy. The Glen Eira Residents’ Association (GERA) thanks Glen Eira Council for the opportunity to present a submission to the 2013 Draft Open Space Strategy. Please note that Council has yet to respond to our 3rd December, 2013 request for information on the disparity between Glen Eira’s open space area as reported in the 1998 (161 ha) and the 2013 (172.9 ha) open space strategies, ie. an increase of 11.9 ha or 119,000 sqm. Since this increase occurred during a period when Glen Eira disposed of more property that was, or had the potential to be, open space than it has acquired (either by purchase or government grant) , GERA requests the right to make a supplementary submission when the requested information is made available by Council. The 1998 Open Space Strategy has been in existence for 15 years and the 2013 Open Space Strategy is proposed to have a similar life span. GERA believes that dramatic population growth, as experienced over the past 10 years and predicted over the next 10 years, requires a more frequent review of the Strategy to ensure that open space facilities address changing demographic needs (eg. passive vs. active, soccer vs. Australian Rules, junior/adolescent vs. senior) and are appropriately budgeted for. During the 15 years of it’s existence little or no reporting of performance against the 1998 strategies/performance measurements has occurred and unfortunately a number of key elements in the 1998 Open Space Strategy have been overlooked (eg. use of open space contribution levy, passive vs active sports needs). These key elements will be highlighted in subsequent points. alleviate the community’s well documented (as indicated in the 4 yearly review of the community plan and the annual State Government Satisfaction Survey) and long standing (over 10 years) dissatisfaction with Glen Eira’s limited open space. ensure that key elements are not overlooked in the future. Enhance Council’s open, transparent and accountable governance statements. The 2013 Draft Open Space Strategy lists 10 master plans or concept plans or management plans for parks within Glen Eira. The dates on these plans range from 1999 to 2004. In line with our above comments on the Open Space Strategy timeframe these master plans need to be reviewed and subject to community consultation to ensure that they meet the dramatically changing needs of the community. The substantial Caulfield Racecourse Reserve (including the centre of the racecourse) is crown land with the designated equal uses of racecourse, public park and public recreation area. Historically limited access and accessibility, combined with a lack of, or inappropriate facilities, have limited it’s use as a public park and public recreation area. Since the 1998 strategy, development of the Phoenix Precinct (Monash University and the MRC’s Caulfield Village) has been approved and the racecourse centre’s available land for public use has been substantially reduced. The significance of this open space (particularly the racecourse centre) has been excluded in the Draft Strategy’s Key Priority Projects, based on its restricted access provisions. The long standing issue of public access to the centre of the racecourse receives only a recommendation that Council “Liaise with the Melbourne Racing Club (MRC) and the Victoria Government as required to investigate the feasibility (GERA emphasis) to include structured sporting use into the areas already set aside for public access”. 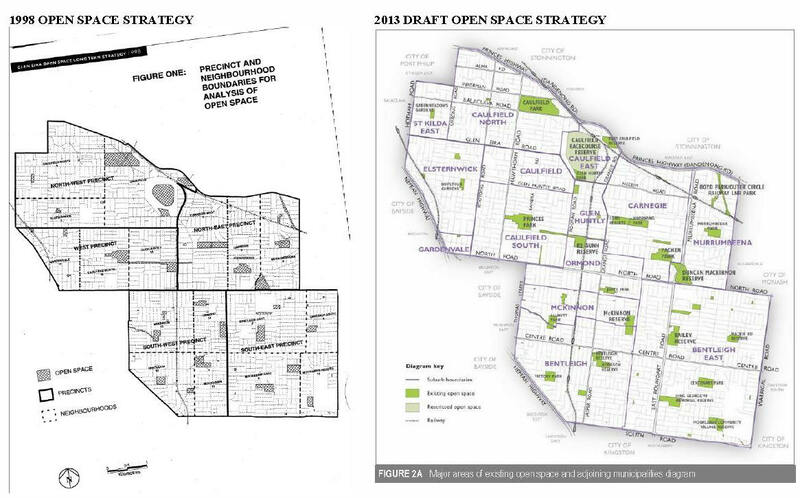 2013 Draft Open Space Strategy recognises the significance of reserve and highlights that the area,which abuts Phoenix Precinct is forecast to have the “greatest population change” within Glen Eira. The intensity of the Phoenix Precinct development, even taking into account the nearby Booran Road Reservoir and the recent landscaping of the centre of the racecourse, open space provisions are considered to be “inadequate” for the Phoenix Precinct’s forecast residential population. Open Space provisions for the Phoenix Precinct’s non-residential population (workers), patrons and visitors were not taken into account in the “inadequate” determination. GERA believes that the public access to the centre of racecourse and the removal of training should be included in the 2013 Draft Open Space Strategy’s Key Priority Projects. Their exclusion downplays the significance of the Centre, both currently and in the future. Rather than being seen as a distinctly separate issue, it should be seen as an integral element to Glen Eira’s Open Space Strategy. Although the 1998 Open Space Strategy recommended imposing the standard maximum rate (5% – of land value at the time of subdivision) for multi-unit developments across the municipality, the Glen Eira Planning Scheme (Clause 52.0) contained a complex system of contribution rates (dependent upon base rates by locality subject to increments determined by various criteria) which resulted in varying rates being applied across the municipality. GERA welcomes the 2013 Draft Strategy simplification of contribution rate calculations by applying a standard flat open space contribution rate across the municipality (as originally proposed in 1998). However, GERA opposes application of a calculated average rate, anticipated to be 4.75% (as advised at the community consultation) and instead advocates that the maximum 5% be applied across the municipality. Additionally, GERA advocates that Glen Eira joins other inner and middle ring Councils in lobbying the State Government to enable applying a maximum 8% contribution rate (of land value at the time of subdivision) for multi –unit dwellings in areas designated as medium to high density development areas, particularly the Commercial and Mixed Use Zones which allow for residential developments without prescribed height limits. Although the 1998 Open Space Strategy suggested open space contribution revenue be expended on “a 50% split between acquisition and improvements” basis, Council’s response to a public question on 18/12/2012 (Council Meeting Minutes 18/12/2012 – Item 11.4) shows more being spent on improvements (85%) than acquisitions (15%). Without assessment guidelines (on how the “purpose of collection” or “the use by the new population” is to be determined), performance measurement or reporting requirements, there is little ensure that any funds collected will be reserved for the acquisition of new parkland. GERA believes that all open space contribution revenue should be reserved for the acquisition of parkland only – capital works and on-going maintenance should be funded from Council funds or government grants. Both the 1998 and 2013 Open Space Strategies recognised/s that open space is used for diverse purposes, broadly classified as being active (ie. structured sports) and passive ( eg. walking, dog walking, exercise, unstructured sports, playgrounds, relaxing, socializing). Both strategies also recognise that passive recreation is the most popular parkland activity and that Glen Eira lacks adequate open space for both passive and active sporting needs. Since 1998 Glen Eira’s focus has been on active sporting needs (pavilions, sports ground improvements) to the detriment of passive needs. While GERA accepts that sports grounds, when not being used for structured sports, may also be used for passive needs, GERA argues that vacant sports grounds do not provide the same enjoyment and relaxation benefits that are provided by specifically designed biodiverse passive recreation areas/parks. GERA therefore advocates a more balanced approach to providing for passive and active needs within existing parkland and larger parkland acquisitions. GERA supports the acquisition of pocket parks (suitably landscaped and equipped, eg. seating and playground equipment) as partly addressing the community’s passive recreation opportunities. The 2013 Draft Open Space Strategy recognises that streets are part of the public realm and, although primarily used for used for transport, are also used for socialising and exercise (eg. walking and cycling). As such streetscapes provide complementary uses to the open space network, provide valuable links within the open space network and contribute to “openness” of the urban environment. While both the planning scheme and Council policies recognise the public realm significance of streetscapes by restricting buildings intruding into beyond property line there is a disturbing trend to grant planning permits for developments, particularly in medium – high density areas, with balconies that intrude into the public realm. Such intrusions are to the detriment of community and the “openness” of the urban environment. GERA therefore advocates compliance with the Planning Scheme and Council Policies and that existing buildings which intrude into the public realm be considered to be anomalies rather than precedents. GERA welcomes the 2013 Draft Open Space Strategy’s recognition that the community regards trees as “the most highly valued feature of open space” and the recommendation that Council’s preparation of “a Strategy to address short and long term management of trees and canopy cover in Glen Eira. This is to include trees on all public land including open space and streets as a minimum” be seen as a very high priority. The 2013 Draft Open Space Strategy includes approximately 25 items as being either very high or high priority issues. GERA advocates Council preparing a schedule, which can be presented for community consultation, ranking these 25 items against a timeline for completion. GERA appreciates the opportunity to submit comments on the 2013 Draft Open Space Strategy and to make a further submission when details of the 1998-2013 11.9 ha (119,000 sqm) increase in open space are provided.